Each year, more than 4 million people in over 20 countries raise much-needed funds and awareness to save lives from cancer through the Relay For Life movement. During a Relay event, participants and survivors celebrate what they've overcome. We remember people lost to the disease, and honor people who have fought or are fighting cancer. The event inspires Relay participants to take action against a disease that has taken too much. 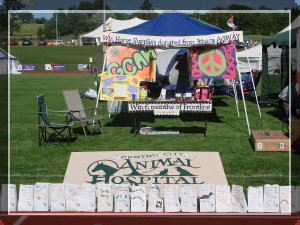 Since 2007, Groton City Animal Hospital has participated as a team in the Relay For Life and have helped to raise funds and awareness to fight this horrible disease that has taken way too many of our loved ones including our 4 legged best friends. In 2013 we also joined the first Bark For Life committee in Cortland/Tompkins County. The American Cancer Society Bark For Life is a fundraising event honoring the life-long contributions of our Canine Caregivers. It presents an opportunity for people to be empowered through their canine companion partnerships and to contribute to cancer cures through the mission of the American Cancer Society. Canine Caregivers are Canine Companions, Guide Dogs, Service Dogs, Rescue Dogs, Therapy Dogs, Police Dogs, Cancer Survivor Dogs, and Diagnostic Dogs, who with their owners, are joining the American Cancer Society as Relay teams. 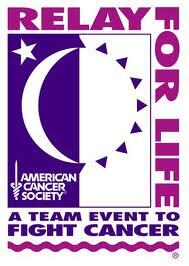 They participate to celebrate cancer survivorship, to honor people lost to cancer, and to fundraise in support of the American Cancer Society mission of eliminating cancer though research, education, advocacy and service. Canine companions demonstrate unconditional love, joy, security, compassion, and no judgments of cancer survivors abilities or appearances. The American Cancer Society Bark For Life is an irresistible way to partner with your canine best friend, smile, and make new friends – canine & human. This is Tex and his mom Kelley. In the fall of 2008, Tex was diagnosed with bone cancer. With lots of support from family and friends it was decided to amputate the affected leg to help slow down the progression of the disease and give him some more time with his family. To start the Relay For Life event, survivors do the first lap around the track. 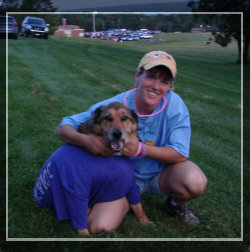 Being that Tex was a dog and not a human, he was not allowed to walk on the track, so Tex and his mom did their survivor lap on the outside of the track with his very own survivor T-shirt. 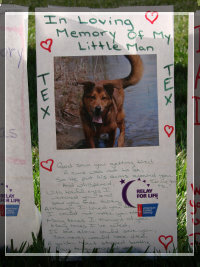 A fighter for sure and the love of Kelley's life - Tex passed away in the fall of 2009. Cancer is cancer whether it invades us or our furry friends - help us fight this fight and donate to our team by purchasing a Groton City Animal Hospital sweatshirt, a Lupine collar (guaranteed even if chewed!) or buying a yummy candy bar that sits on the front counter just tempting you to eat it! !